The society invites applications for research fellowships, a program designed to encourage faculty, independent researchers, and students to use and publish from the society's rich holdings. We're thrilled to announce that we've exceeded our #GivingTuesday goal of $7,000 and have fully funded three $2,500 Research Fellowships! Your generosity will help open doors to scholars, students, and independent researchers who wish to use PHS’s rich holdings. Thank you for your support! The program will award research and travel grants of $2,500. Applicants must demonstrate a need to work in the society's collection for a minimum of one week and a maximum of one month. Applications are accepted from persons whose normal place of residence is farther than seventy-five miles from Philadelphia. Projects in all fields of study, including history, American studies, women's studies, mission history, architecture, and ecumenism are invited. In accepting this grant, fellows agree to submit a report to the society within two months of their last visit. 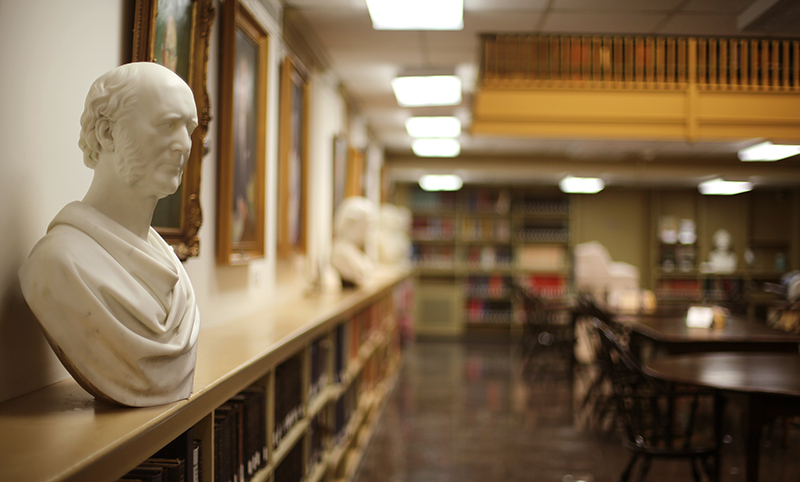 The society requests a copy of each final work for its holdings, and fellows are encouraged to adapt their research for publication in the Journal of Presbyterian History. Eligibility: These grants are open to scholars, students, and independent researchers. Awards: The grants of $2,500 cover travel, lodging, and other research expenses. Application procedures: Applications must be received at the society by January 31, 2020, with awards announced by March 13, 2020. To apply for a Research Fellowship via postal mail: Submit your completed application and a brief curriculum vitae. Also include two letters of reference, which may be sent separately by the letter writers. We request that the vitae not exceed two pages and must list all earned degrees, date received (or expected), institution, and field of study as well as any major publications. Download the application in PDF format. Note: Do not fill out the form using your browser’s PDF Preview application or Mac Preview because it will corrupt the form and your data will not be visible. Please only use Adobe Reader to open and fill out the form. Download Adobe Reader (free) at https://get.adobe.com/reader/. To apply for a Research Fellowship via email: Attach the completed application and your brief curriculum vitae to an email. Letters of reference must be sent attached to emails from the letter writers, and the letter must be a scanned PDF with original signature. Applications will be reviewed by independent scholars and PHS staff. Yasmina El Chami, graduate student at the University of Cambridge, for "Constructing Beirut: Missionary Education and the Project of the City in Nineteenth-Century Lebanon"
Kevin Rose, graduate student at the University of Virginia, for "Living Green: The Neoliberal Climate of Protestant Environmentalism"
Christopher W. Anderson, graduate student at the University of Illinois at Chicago, for "The Environmental History of Outdoor Ministry, 1945-2008"
Youngeun Koo, graduate student at the University of Tuebingen (Eberhard Karls Universität Tübingen), Germany, for "'Children in Need' and Intercountry Adoption from South Korea (1953-1979)"
Johanna L. Peterson, graduate student at the University of California, San Diego, for "'A Measure of All Nations': Girls' Schools and Constructions of Citizenship in Lebanon, 1919-1951"
Dr. Yaqoob Bangash, Forman Christian College, for his book project, Literacy and Character Building: The American Presbyterian Mission in the Punjab, 1849-1972. Julian Cole Phillips, graduate student at New York University, Hagop Kevorkian Center for Near Eastern Studies, for his project, "Iranian Students in the Tehran Community School, 1935-1980." Dr. Christopher Pearl, Lycoming College, for his book project, “For the Good Order of Government”: The American Revolution and the Creation of the Commonwealth of Pennsylvania, 1740-1799. Kristen A. Shedd, Ph.D. candidate, University of California, Santa Barbara, "The Decline of Moral and Political Authority: Mainstream Protestants in McCarthyite America." Noel C. Stringham, Ph.D. candidate, University of Virginia, "Nuer Strategies of Inclusion: Gender and Religion in South Sudan (1805-2006)." Christopher Schlect, Ph.D. candidate, Washington State University, "Battle for the Good Earth: Empire and Gender Meet Fundamentalism and Modernism." Gene Zubovich, Ph.D. candidate, University of California, Berkeley, "Protestant Social Consciousness in the 1940s." Beth Hessel-Robinson, Ph.D. candidate, Texas Christian University, "'Let the conscience of Christian America speak! ': How White Protestant Churches Responded to the Evacuation and Internment of Japanese Americans During World War II." Shing-Ting Lin, Ph.D. candidate, Columbia University, "The Female Hand: The Making of Professional Women’s Medicine in Modern China, 1880-1940." Stephen Dove, Ph.D. candidate, University of Texas at Austin, "Creating Local Protestantism in Guatemala, 1882-1935." G. Kurt Piehler, Associate Professor, University of Tennessee, A Religious History of the American GI in World War II. Robert Bauman, Associate Professor, Washington State University, Religion, Community Organizations, and the Long War on Poverty. John Hardin, Ph.D. candidate, University of Maryland, "Retailing Religion: Corporate Advertising and Marketing in American Christian Churches, 1900-2000." Matthew McCullough, Ph.D. candidate, Vanderbilt University, "To Extend the Blessings of Liberty: Protestant Missions and the Language of Expansion in the Spanish-American War." C. Scott Nesbitt, Ph.D. candidate, University of Virginia, "The Politics of Forgiveness after Slavery and the American Civil War." Joshua Allen Paddison, Ph.D. candidate, University of California at Los Angeles, "American Heathens: Religion, Race, and Reconstruction in California." LeeAnn Reynolds, Ph.D. candidate, Vanderbilt University, "Red and Yellow, Black and White: Maintaining Segregation, 1920-1955." Zahra Pamela Karimi, Ph.D. candidate, Massachusetts Institute of Technology, "The Role of American Presbyterian Missionaries in Reforming Iranian Domesticity, 1838-1945." Kyle B. Roberts, graduate student, University of Pennsylvania, "Presbyterian Evangelicals in Early New York City." Ellen J. Fleischmann, University of Dayton, Under an American Roof: The Encounter among Women of Greater Syria and American Protestant Women, 1830-1950. Jasamin Rostam-Kolayi, California State University, San Marcos, Gender, Class, and Nation: The Women's Press and Education Reform in Iran, 1890s-1950s. Gardiner Humphrey Shattuck, Jr., American Protestant Responses to Genocide, 1915-1950. Andrew Witmer, University of Virginia, The Color of Faith: Protestant Foreign Missions to Africa and American Approaches to Race. Richard J. Bell, graduate student, Harvard University, "Daily Lifting the Poisoned Bowl: Reform and Suicide in the Early Republic." James F. Findlay, Jr., Professor Emeritus, University of Rhode Island, Kingston, A History of the National Council of Churches of Christ in America 1974-2004: An Exploratory Essay. Sean Michael Lucas, Adjunct Professor of Church History, Covenant Theological Seminary, St. Louis, For a Continuing Presbyterian Church: Conservative Dissent in the Presbyterian Church in the United States, 1924-1974. Karen Fisher Younger, Lecturer, Pennsylvania State University, Female Colonization Supporters in Antebellum America.